Yesterday I saw something I’ve never seen in a baseball game before: a runner getting hit by a batted ball, which according to Rule 7.08(f) means the runner is out and the ball is dead. It turns out that this isn’t as unusual an event as I’d thought (see below), but what was unusal is that this ended the game between the Angels and Giants. Even stranger, this is also how the game between the Diamondbacks and Dodgers ended. Let’s use Retrosheet data to see how often this happens. Retrosheet data is organized into game data, roster data and event data. Event files contain a record of every event in a game and include the code BR for when a runner is hit by a batted ball. Here’s a SQL query to find all the matching events, who got hit and whether it was the last out in the game. Here's what the query does. The first sub-query sub finds all the events with the BR code, determines which team was batting and finds the id for the player who was running. This is joined with the roster table so we can assign a name to the runner. Finally, it’s joined with a subquery, max_events, which finds the last event in each game. Once we’ve got all that, the SELECT statement at the very top retrieves the columns of interest, and records whether the event was the last out of the game. Retrosheet has event data going back to 1922, but the event files don’t include every game played in a season until the mid-50s. Starting in 1955 a runner being hit by a batted ball has a game twelve times, most recently in 2010. On average, runners get hit (and are called out) about fourteen times a season. Yesterday, the Baltimore Orioles and Chicago White Sox played a game at Camden Yards in downtown Baltimore. The game was “closed to fans” due to the riots that broke out in the city after the funeral for a man who died in police custody. It’s the first time a Major League Baseball game has been played without any fans in the stands, but unfortunately it’s not the first time there have been riots in Baltimore. After Martin Luther King, Jr. was murdered in April 1968, Baltimore rioted for six days, with local police, and more than eleven thousand National Guard, Army troops, and Marines brought in to restore order. According to wikipedia six people died, more than 700 were injured, 1,000 businesses were damaged and close to six thousand people were arrested. At that time, the Orioles played in Memorial Stadium, about 4 miles north-northwest of where they play now. I don’t know much about that area of Baltimore, but I was curious to know whether the Orioles played any baseball games during those riots. 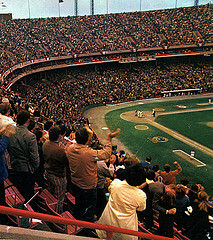 Retrosheet has one game, on April 10, 1968, with a reported attendance of 22,050. The Orioles defeated the Oakland Athletics by a score of 3–1. Thomas Phoebus got the win over future Hall of Famer Catfish Hunter. Other popular players in the game included Reggie Jackson, Sal Bando, Rick Mondy and Bert Campaneris for the A’s and Brooks Robinson, Frank Robinson, Davey Johnson, and Boog Powell for the Orioles. The box score and play-by-play can be viewed here. Next month I’ll be attending a game at Wrigley Field and my brother and I had some discussion about the best strategy for us to meet up somewhere in Chicago after the game. Knowing how long a game could be, and how many people are likely to be crowding the train platforms is useful information that can be inferred from the game data that http://www.retrosheet.org/ collects and distributes. It’s also a good excuse to fiddle around the the IPython Notebook, pandas and the rest of the Python scientific computing stack. Game length in minutes is in column 19. Let’s read it and analyze it with Pandas. The statistics look reasonable, except that it’s unlikley that there was a completed game in 21 minutes, or that a game took 11 days, so we have some outliers in the data. Let’s see if something else in the data might help us filter out these records. What about the really short games? Many of these aren’t nine inning games because there are less than 51 outs (8 innings for a home team, 9 for the visitor in a home team win ✕ 3 innings = 51). At the moment, I’m interested in looking at how long a game is likely to be, rather than the pattern of game length over time, so we can leave these records in the data. Now we filter the data to just the games played since 2000. The average game length between 2000 and 2012 is 175 minutes, or just under three hours. And three quarters of all the games played are under three hours and ten minutes. Here’s the code to look at the distribution of these times. 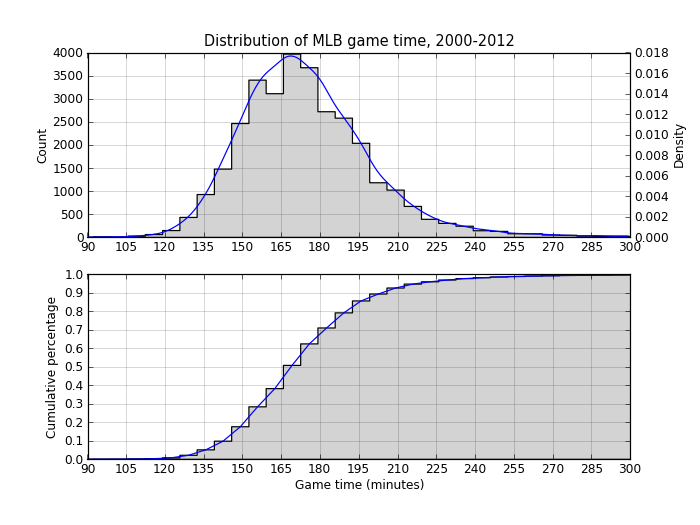 The top plot shows a histogram (the count of the games in each bin) and a density estimation of the same data. The second plot is a cumulative density plot, which makes it easier to see what percentage of games are played within a certain time. The two plots show what the descriptive statistics did: 70% of games are under three hours but it’s not uncommon for games to last three hours and fifteen minutes. Beyond that, it’s pretty uncommon. Now let’s look at how game times have changed over the years. First we eliminate all the games that weren’t complete in 51 or 54 innings to standardize the “game” were’re evaluating. That shows a pretty clear upward trend interrupted by a slight decline between 1960 and 1975 (when offense was down across baseball). 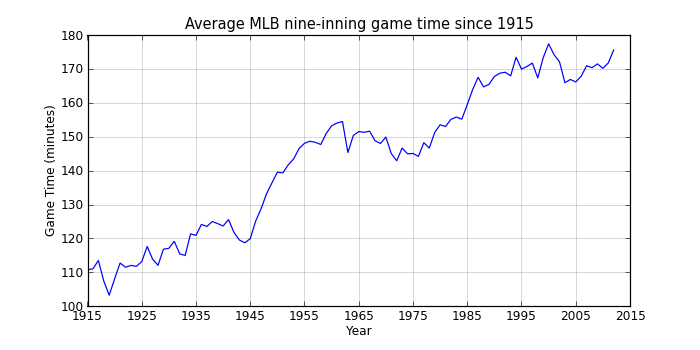 Since the mid-90s, game times have hovered around 2:50, so maybe MLB’s efforts at increasing the pace of the game have at least stopped what had been an almost continual rise in game times. I’ll be seeing a game at Wrigley Field, so let’s examine attendance at Wrigley. Attendance is field 17, “Park ID” is field 16, but we can probably use Home team (field 6) = “CHN” for seasons after 1914 when it opened. Looks like the zeros are just missing data because these games have relevant data for the other fields and it’s impossible to believe that not a single person was in the stands. We’ll get rid of them for the attendance analysis. 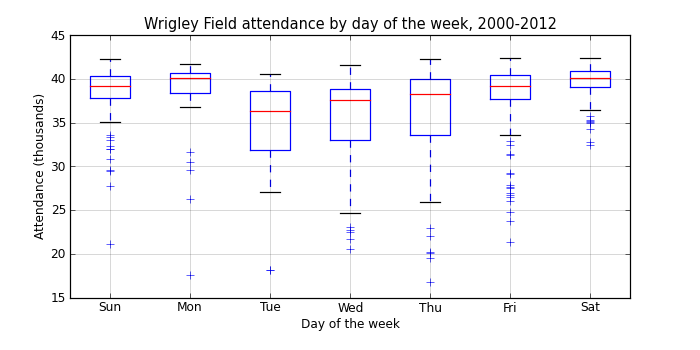 Now we’ll filter the games so we’re only looking at day games played at Wrigley where the attendance value is above zero, and group the data by day of the week. plt.savefig('attendance.svg') # lines don't show up? There’s a pretty clear pattern here, with increasing attendance from Tuesday through Monday, and larger variances in attendance during the week. It’s a bit surprising that Monday games are as popular as Saturday games, especially since we’re only looking at day games. On any given Monday when the Cubs are at home, there’s a good chance that there will be fourty thousand people not showing up to work! 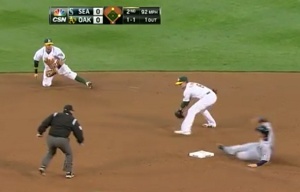 Yesterday I attempted to watch the A’s Opening Day game against the Mariners in the Oakland Coliseum. Unfortunately, it turns out the entire state of Alaska is within the blackout region for all Seattle Mariners games, regardless of where the Mariners are playing. The A’s lost the game, so maybe I’m not too disappointed I didn’t see it, but for curiousity, let’s extend Major League Baseball’s Alaska blackout “logic” to the rest of the country and see what that looks like. First, load in the locations of all Major League stadiums into a PostGIS database. There are a variety of sources for this on the Internet, but many are missing the more recent stadiums. I downloaded one and updated those that weren’t correct using information on Wikipedia. Yep. Folks in Alaska are supposed to travel 2,468 miles (3,971,338 meters, to be exact) in order to attend a game at Safeco Field (or farther if they’re playing elsewhere because the blackout rules aren’t just for home games anymore). Based on this, Hawaii would be the place to live as they can actually watch all 30 teams! Except the blackout rules for Hawaii are even stupider than Alaska: they can’t watch any of the teams on the West Coast. Ouch! This is stupid-crazy. It seems to me that a more appropriate rule might be buffers that represent a two hour drive, or whatever distance is considered “reasonable” for traveling to attend a game. When I lived in Davis California we drove to the Bay Area several times a season to watch the A’s or Giants play, and that’s about the farthest I’d expect someone to go in order to see a three hour baseball game. I’m sure there are other issues going on here, such as cable television deals and other sources of revenue that MLB is trying to protect. But for the fans, those who ultimately pay for this game, the current situation is idiotic. I don’t have access to cable television (and even if I did, I won’t buy it until it’s possible to pick and choose which stations I want to pay for), and I’m more than 2,000 miles from the nearest ballpark. My only avenue for enjoying the game is to pay MLB $130 for a MLB.TV subscription. Which I happily do. Unfortunately, this year I can’t watch my teams whenever they happen to play the Mariners.